On PC if there’s a player like “__Insert notoriously laggy player here who thinks he’s good” and they go to player list and see he has 20% packet loss… They would kick him to get fair fights in… But console kicks players who are good at the game or team kill. Not lag. @GeneralGatelo unfortunately it seems as if few people don’t understand what ping is or they don’t look at it. I do my best to kick all 130+ in east yet the randoms never seem to vote yes. Im constantly kicked every game by people with much higher ping even though i did nothing wrong except play archer and be a dik. You live in a large city and have access to fast internet? Who would have thought!? Now move to a small town in the Midwest or south and see what internet options are available. P2P servers might work in a small country with a good cable infrastructure, but not in the US. I have the same provider, the only available besides DSL here, and my max is 60/5, which typically runs at half that. Got anything useful to say, ever? Contribute to the conversation or leave. You have an opinion about P2P servers being viable in a competitive game? @Naleaus I can say whatever I want there genius. And @C4KE-from-SP4C3 everyone except this nub is entitled to an opinion. His is invalid because people who but into conversations where they aren’t wanted on a regular basis don’t get to have opinions, they get to shut their mouths. And yes I do have an opinion. I think dedicated servers, if they are maintained, are a significantly better option because in P2P if I want to lag a server I can turn on Netflix on my laptop if I’m hosting and destroy the server, which people do rather consistently in P2P games. Way to be a hypocrite, you weren’t in the conversation and hopped in because you don’t like me. Sorry, you don’t get to choose who can or can’t post. You even agree with my point, but decide to froth at the mouth that I dared post my opinion. Here’s a tip, ignore me if my posting bothers you. Either everyone else already does, or judging by the upvotes, they actually like my posts. 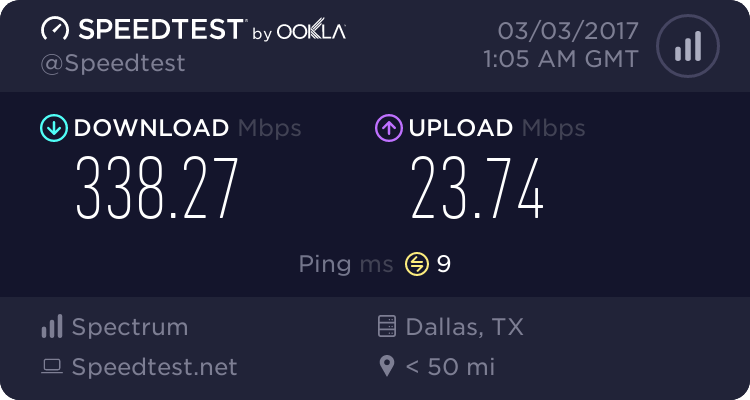 @Naleaus my grandmother has 100mbps up/DL speed. She lives in the country in Oklahoma. When you don’t live near big cities, ISP’s a lot of times refuse to invest in decent infrastructure. Mainly because of 2 reasons; 1 not much competition in the area, 2 not enough people live in the area, that means they don’t get that crazy amount of money from that area so they just don’t bother getting better infrastructure. You think that applies to everywhere? I already told you the max I can get is 60/5. I’d pay more for faster, it’s not an option. The United States is a large country, the infrastructure is not there for all locations, and as long as monopolies exist, it won’t get better in small locations. Google Fiber caused quite a few ISPs to increase their speeds, unfortunately they’re not expanding anymore. As for packetloss, not a lot you can do about that either, cause internet speed isn’t the only thing that causes that. If you’re connecting to a server in Chicago and a router along the way is over capacity, congrats, you have packetloss. You can’t control that short of using a VPN, which causes other latency issues. @Ser-iNSaNiTY I have 330 DL. Downloading a game does literally nothing to my connection. I’d have to upload a bunch of videos.